German Orientalist and historian; born at Reichmansdorf, near Bamberg, Dec. 22, 1798; died in Berlin March 17, 1870. His parents were named Bamberger. Entering first upon a business life, Neumann later studied at Heidelberg (coming under the influence of Creuzer and Hegel), Munich (where he became a Lutheran), and Göttingen. He became professor in the gymnasium at Speyer in 1822, but in 1825 was removed for certain religious utterances, after which he lived in private in Munich until 1827. 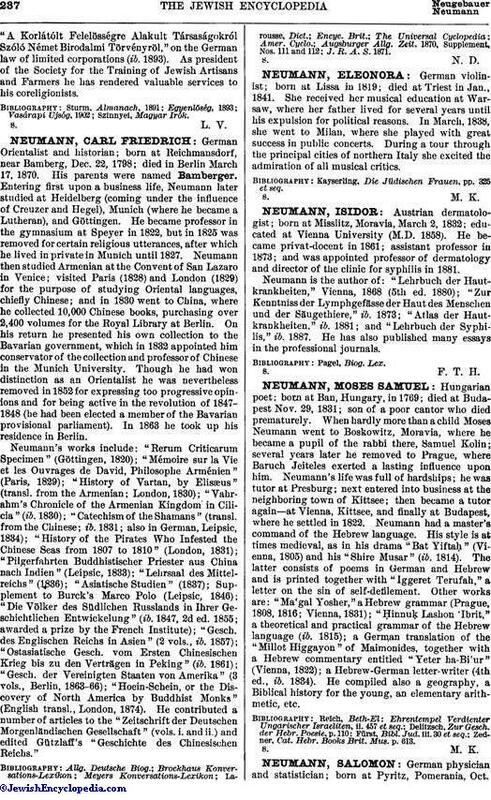 Neumann then studied Armenian at the Convent of San Lazaro in Venice; visited Paris (1828) and London (1829) for the purpose of studying Oriental languages, chiefly Chinese; and in 1830 went to China, where he collected 10,000 Chinese books, purchasing over 2,400 volumes for the Royal Library at Berlin. On his return he presented his own collection to the Bavarian government, which in 1832 appointed him conservator of the collection and professor of Chinese in the Munich University. Though he had won distinction as an Orientalist he was nevertheless removed in 1852 for expressing too progressive opinions and for being active in the revolution of 1847-1848 (he had been elected a member of the Bavarian provisional parliament). In 1863 he took up his residence in Berlin. Neumann's works include: "Rerum Criticarum Specimen" (Göttingen, 1820); "Mémoire sur la Vie et les Ouvrages de David, Philosophe Arménien" (Paris, 1829); "History of Vartan, by Elisæus" (transl. from the Armenian; London, 1830); "Vahrahm's Chronicle of the Armenian Kingdom in Cilicia" (ib. 1830); "Catechism of the Shamans" (transl. from the Chinese; ib. 1831; also in German, Leipsic, 1834); "History of the Pirates Who Infested the Chinese Seas from 1807 to 1810" (London, 1831); "Pilgerfahrten Buddhistischer Priester aus China nach Indien" (Leipsic, 1833); "Lehrsaal des Mittelreichs" (1836); "Asiatische Studien" (1837); Supplement to Burck's Marco Polo (Leipsic, 1846); "Die Völker des Südlichen Russlands in Ihrer Geschichtlichen Entwickelung" (ib. 1847, 2d ed. 1855; awarded a prize by the French Institute); "Gesch. des Englischen Reichs in Asien" (2 vols., ib. 1857); "Ostasiatische Gesch. vom Ersten Chinesischen Krieg bis zu den Verträgen in Peking" (ib. 1861); "Gesch. der Vereinigten Staaten von Amerika" (3 vols., Berlin, 1863-66); "Hoein-Schein, or the Discovery of North America by Buddhist Monks" (English transl., London, 1874). He contributed a number of articles to the "Zeitschrift der Deutschen Morgenländischen Gesellschaft" (vols. i. and ii.) and edited Gützlaff's "Geschichte des Chinesischen Reichs." J. R. A. S. 1871.